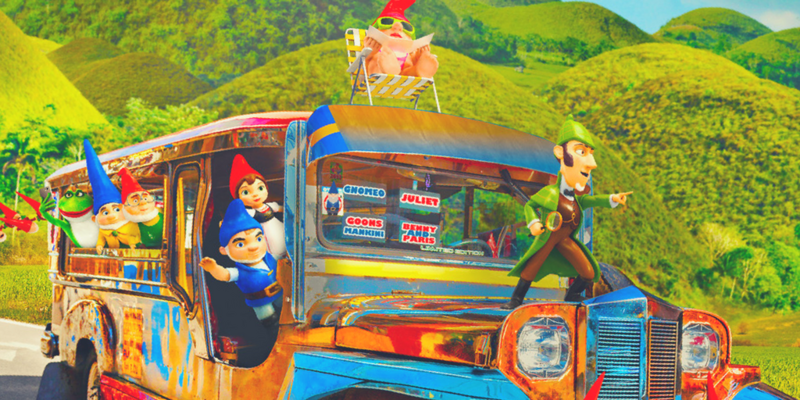 Sherlock Gnomes Visits The Philippines! The gnomes have gone missing! Do you know where they are? It did not take a Sherlock to find out that they are in the Philippines traveling aboard the iconic jeepney in Bohol! The cute and adorable garden gnomes from Gnomeo and Juliet are back in Sherlock Holmes for an all-new adventure in London! Spring is coming and getting the new garden ready for the season is Gnomeo and Juliet’s biggest concern. As if their problem is not enough, they soon discovered that someone is kidnapping garden gnomes all over London. With almost everyone gone, there is only one gnome they can call for help- Sherlock Gnomes! Along with his sidekick Watson, the famous detective and sworn protector of London’s garden gnomes, Sherlock investigates the case. It was not long till the mystery led them to an all-out adventure where they encountered new ornaments and explored the undiscovered side of the city. Sherlock Gnomes features the voices of returning cast, James McAvoy, Emily Blunt, Michael Caine, Maggie Smith, Stephen Merchant, and Ozzy Osbourne. Johnny Depp joins the adventure as the voice of Sherlock Gnomes, Chiwetel Ejiofor as Watson, and Mary J. Blige as Irene. The film is based on characters by Rob Sprackling & John Smith and Andy Riley & Kevin Cecil and Keely Asbury and Steve Hamilton Shaw. It comes out in cinemas on March 21.